Have you tried the latest fad diet? Did it fail you? Worse yet, did you lose weight only to gain even more later? Have you been dieting for decades with no real results? Have you given up on your health? Scared to start? Believe change is too difficult? Settling for the status quo? Afraid you will fail? 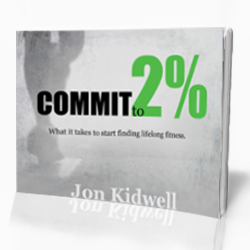 As a former "inactivity expert" and now certified personal trainer I can tell you the single most important step to start losing weight and living fit is movement. Why movement is more important than ever. The percentage of people that are obese, die of heart disease, and have diabetes continues to rise each year. 31 million Americans suffer from back pain. The #1 cause of which is being inactive for long periods of time. Inactivity combined with poor eating habits have led to a generation of young people that are predicted to live shorter lives than their parents. We need to stop ignoring the fact that inactivity is destroying our health and our lives. Let's get real about our health. Let's commit. It doesn't have to be that complicated. Start moving 30 minutes EVERY day. 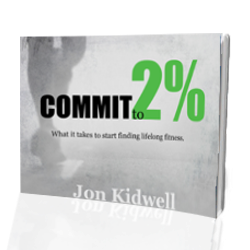 Commit to 2%. Let's all take the first step. Let's change the statistics. Let's stop the cycle of unhealthiness. Read the book. Start moving. Begin your journey to a healthy life. What would committing to 30 minutes a day of being active look like for you?